Item Number: 810-S1850E410 18369 Actual Weight: 10 lbs. 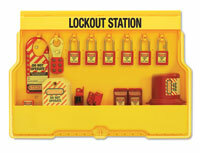 Organizes and stores locks, hasps and other lockout devices. Durable construction makes this ideal for use in corrosive environments while cover protects contents from dust and grime. 8 hanger clips hold 2 padlocks or lockout hasps each. Top and bottom compartments each have 5 moveable dividers for organizing. Hang peg hook hangers (not included) from holes inside and along bottom station for additional storage. Filled electrical lockout station or unfilled station available.